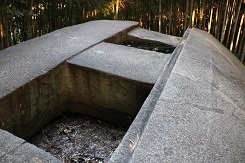 The Ishibutai Tomb is the most impressive of the ancient stone monuments in Asuka. 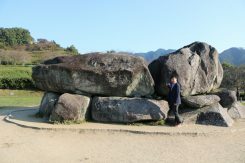 It is believed to be the burial tomb for Soga no Umako, a powerful leader of the Soga clan that ruled the country for most of the Asuka Period (538-710). The largest stone which I touch is part of the ceiling and weighs about 77 tons. 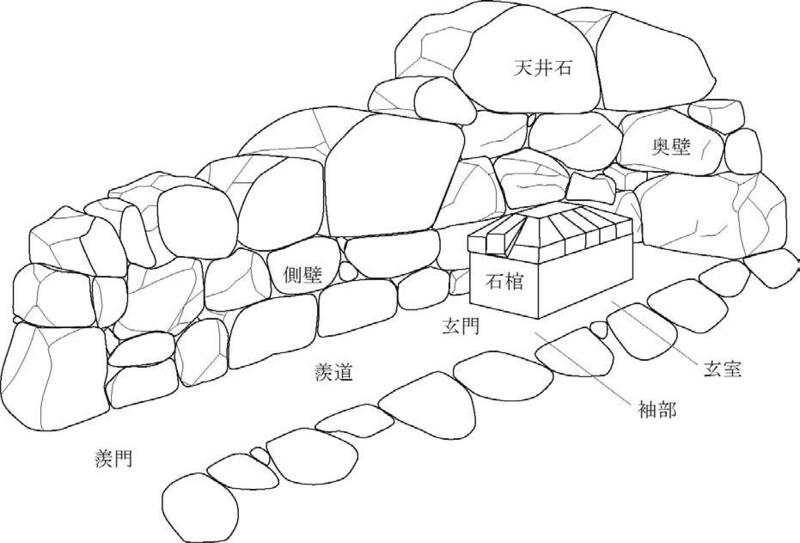 About 30 granodiorite megaliths (~2300 tons) make up the inner chamber of the tomb that was originally covered by an earthen mound. 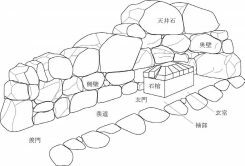 Ishibutai is a yokoana corridor-type tomb, and a stone coffin was placed in the inner chamber, 7.5 m long, 3.4 m wide and 4.8 m high. The walls of the chamber consisted of various sized rocks during this period, and it was gradually changed to artificially carved stone instead of rock as time went on. 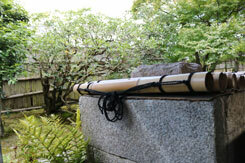 The Japanese could already carry, chisel and fabricate giant stones 1400 years ago. The working population to build huge tombs by using advanced technology and the amount of money was overwhelming. 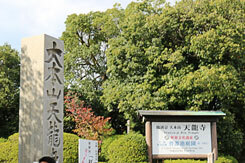 Further information about Ishibutai Tomb is written in "Ishibutai Kofun Kaisetsusho ~ Mysteries of Ancient Huge Tomb ~". The visual images developing the tomb are recreated using computer graphics based on survey results. 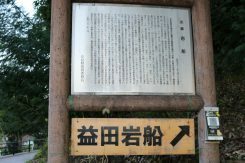 One of the most unique features of Asuka period (250-552 AD) is the multiple carved Asuka-ish, very hard granodiorite stones with peculiar shapes in various parts of the region. 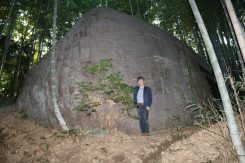 The largest and most unusual of the carved stones is the Masuda-no-iwafune (the 'rock ship of Masuda’). 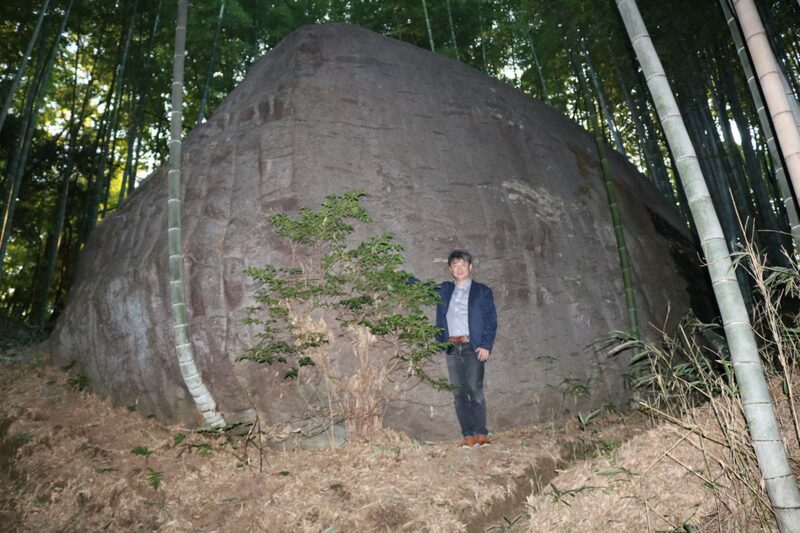 The stone carving, which stands near the top of a hill in Asuka, is 11 meters in length, 8 meters in width and 4.7 meters in height, and weighs approximately 800 tons. 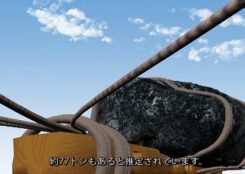 The top of has been completely flattened and there are two one-meter square holes carved into it and a ridge line that is parallel to both holes. At the base of the stone are lattice-shaped indentations which are believed to be related to the process that was used by the builders to flatten the sides of the rock. We believe that the rock is just the remains of a stone chamber of a tomb that was designed for members of the royal family. It was just left here unfinished because it was too heavy and/or cracks were found. The grave is a stone-type burial chamber like the Ishibutai tomb dug into man-made octagonal hills, where Emperor Tenmu and his wife Empress Jito were interred using the wooden coffin and cremation urn, respectively. Emperor Jito ordered, for the first time for the Imperial family, that she be cramated and her urn placed by the side of her husband's coffin connected by chains, so they could not be separated from each other. She built the stone chambers made of granodiorite in order to keep the spirit and material eternally. The Imperial Household Agency administers the grave even now after more than 1300 years. 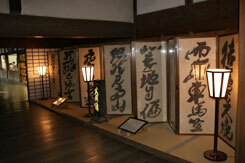 Recently, Emperor Jito’s successful life becomes a spectacle comic story named "Tenjo-no-niji" by SATONAKA Machiko. Japanese used to worship a megalith in Shinto. There is the mysterious Ishi-no-Hoden megalith at Ohshiko shrine in Takasago City. As described in "Harima no kuni fudoki" it was built about 1400 years ago in the period of Prince Shotoku, or according to the shrine’s tradition, it was built about 2000 years ago in the period of Emperor Sujin. 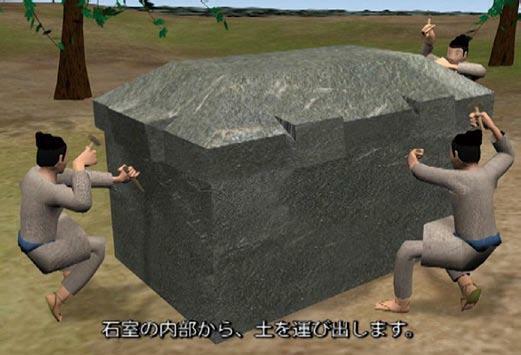 People prayed to the artificial floating megalith after chiseling the rock into cubic shape as an object of worship. It might be a miracle to chisel it like this in those days! 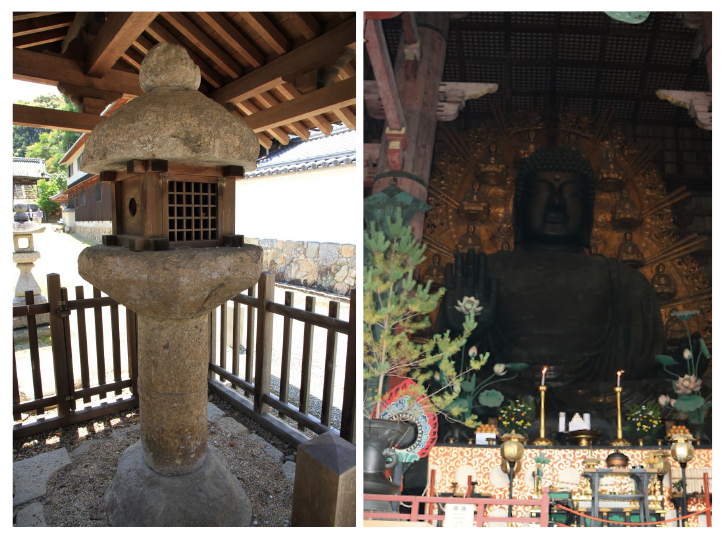 About 1300 years ago, stone lanterns were first built in order to keep the offering of light burning. The oldest extant lantern in Japan today is the Asuka period lantern at Taima-ji Temple in Nara. The lantern was made of a kind of tuff stone which are easily carved and of the complex of woods and stone because of technical problem in those times. Buddha statues were gradually developed as stone sculptures in this period, which had previously been made as wood sculpture or metal casting. 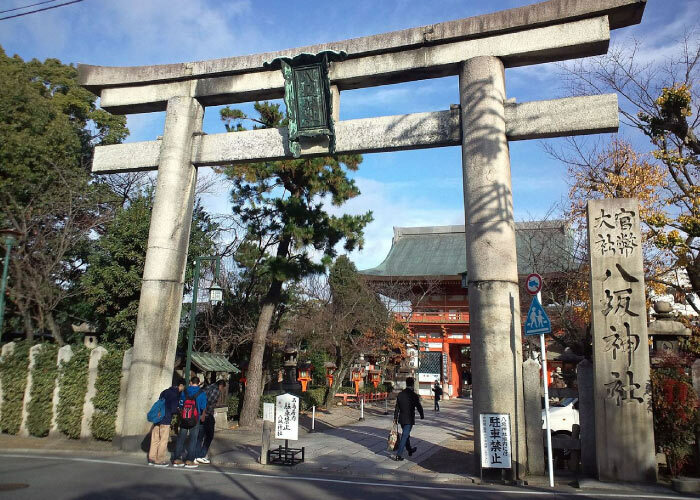 Stone torii (an archway to a Shinto shrine made of stone) was first built in late Heian period, about 1000 years ago, and the current style of torii spread all over the country during the Edo period. 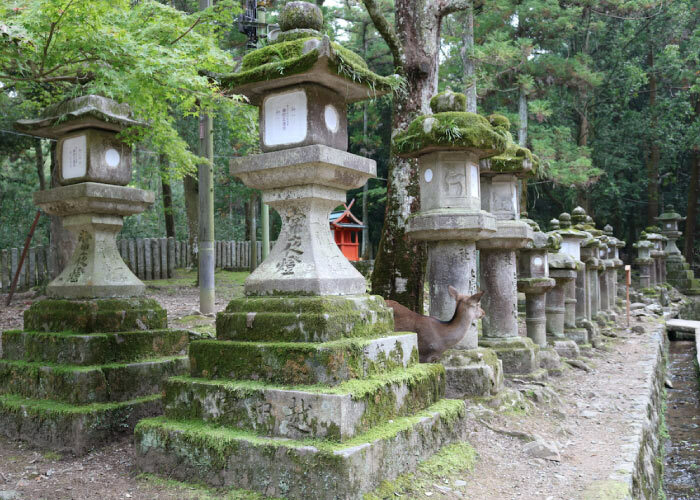 People competed with others in donating stone lanterns to the shrine so that they could leave their name to posterity as a symbol of wealth from their successful life. Water basins used to rinse the hands before entering a shrine were also donated by powerful merchants. 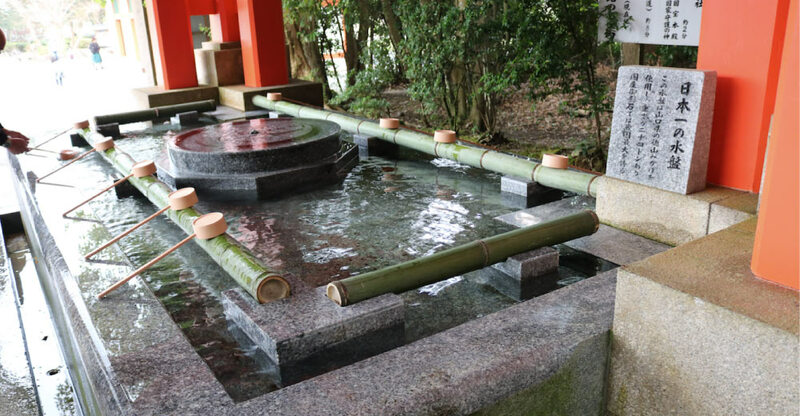 The biggest water basin in Japan was donated to Usa-jingu, which was made of the granite named Tokuyama Mikage. Tenryu-ji is a temple registered as a UNESCO World Heritage Site, established in 1339 by the shogun Ashikaga Takauji (1305-1358) in memory of Emperor Go-Daigo. 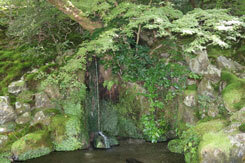 Zen master Muso Soseki designed the Sogenchi Garden with a strolling pond and an arrangement of several large standing rocks. Stones are placed all around the temple and are used to portray the spirit of Zen through an exquisite combination of art and nature. In 1482, shogun Ashikaga Yoshimasa built Ginkaku-ji (Silver Pavillion) as his retirement villa, and was converted into a Zen temple after his death in 1490, which has the aspects of wabi-sabi's highest quality. 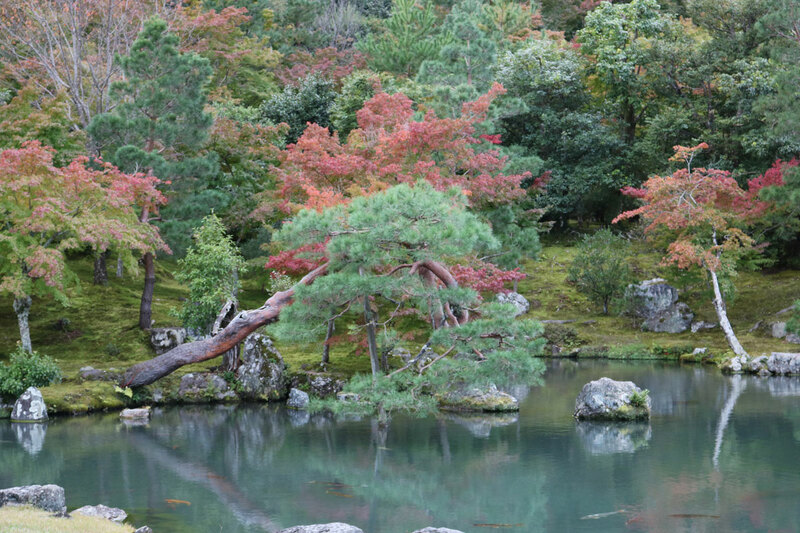 Ginkaku-ji shows a different face from season to season, looking quiet in spring, reflecting the fresh green color in the season of verdure, and incredibly beautiful in the season of colored leaves. 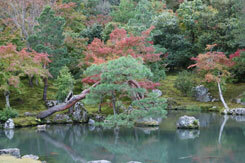 In winter time, Ginkaku-ji covered with snow embodies the best of wabi-sabi. 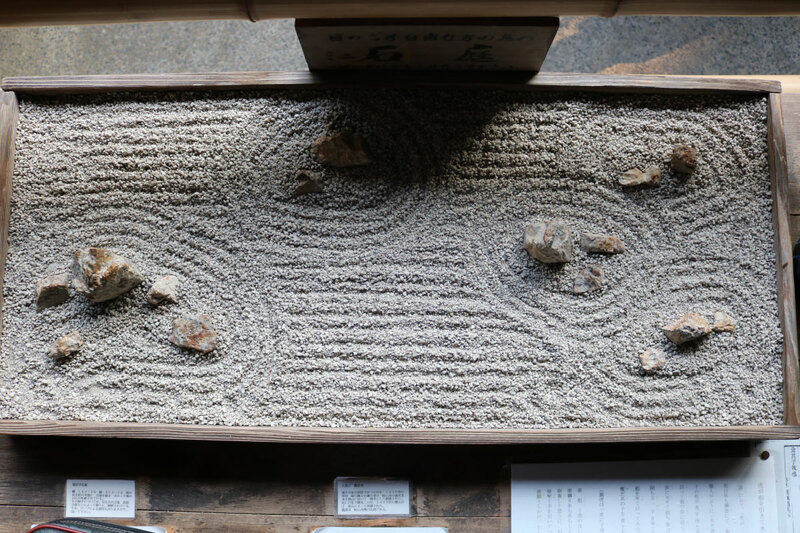 Based upon an aesthetic rooted in Zen philosophy, Ginkaku-ji Temple oozes wabi-sabi everywhere from its faded, wooden panels to the stone garden that invokes a feeling of cleansing and renewal. 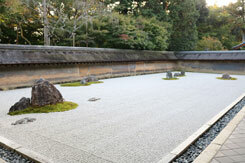 Another example of wabi-sabi on the temple grounds is a sea of raked white sand leading to a towering cone – a landscape created for moon gazing. 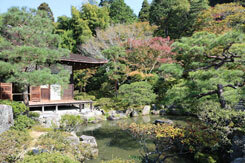 The abbot’s hall [Hojo] and Zen rock garden of Ryoanji was established by Hosokawa Masatomo in 1499, which is listed as a UNESCO World Heritage Site. 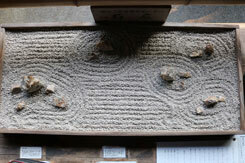 Fifteen stones of various sizes are arranged in the space of a mere 248 square meters. 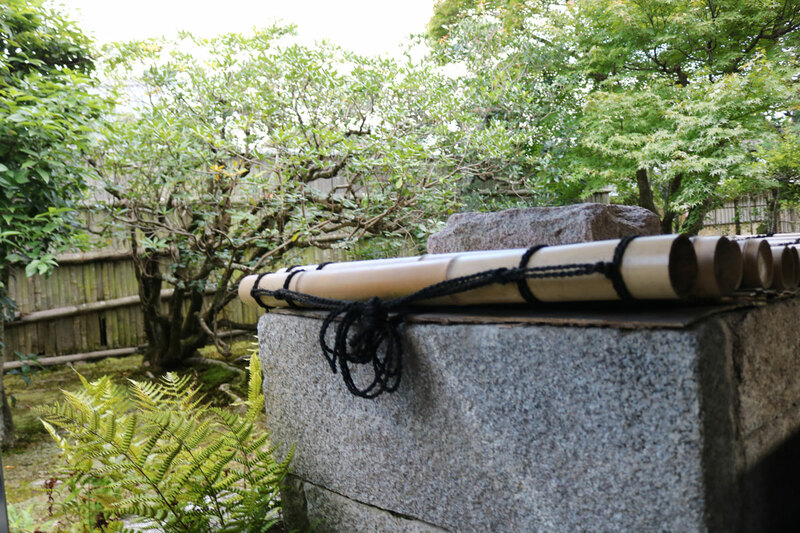 The stones are placed so that the entire composition cannot be seen at once from the veranda of Hojo, also arranged so that when looking at the garden from any angle only 14 of the boulders are visible, which presents a beauty of things imperfect, wabi-sabi. 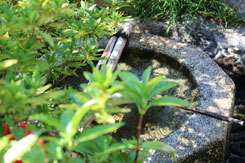 Fifteen is a special number in Eastern Culture, regularly using the lunar calendar which means full moon.